The Griffith Hack Clean & Sustainable Technologies Group is Australia’s pre-eminent provider of intellectual property services to organisations that develop technologies with a reduced environmental impact. We have been immersed in these technologies for many years. We constantly monitor technological advances, review relevant economic and legislative developments, and align ourselves with key industry, academic and governmental players. Why – we believe that the IP we produce for our clients needs to reflect, anticipate and protect current and future trends, models and instruments and, in addition, capture the downstream benefits. We call this – clean and green IP. We are excited by the challenges and opportunities that now present to Australian technologists – we enjoy working with them in transferring their technology globally. We also hope you find this blog provides some good links and feeds of interest. We welcome your feedback! Did you know that a North Carolina State University staff has demonstrated that water gel-based solar devices (called: “artificial leaves”) can act like solar cells to make electricity? The study has been released on-line inside the Journal of Materials Chemistry by Doctor. Orlin Velev, an Invista Professor associated with Chemical and Bio-molecular Engineering. The findings prove the idea for making solar cells that more closely imitate nature. They also have the possibility to be cheaper and more environmentally friendly than the existing standard silicon based solar cells. The bendable products are composed of water-based gel infused using light-sensitive molecules (like plant chlorophyll) coupled with electrodes coated by carbon materials, such as carbon nanotubes or graphite. Graphene is the basic structural element of a number of carbon allotropes including graphite, carbon nanotubes and fullerenes. Graphene is a one-atom thick planar sheet of carbon atoms that are largely packed in a honeycomb crystal lattice. The title comes from graphite ene; graphite itself consists of a lot of graphene sheets piled together. The light-sensitive molecules get “excited” by the sun’s rays to create electricity, similar to plant molecules that get excited to synthesize sugar in order to grow. Dr. Velev says that the research team hopes to “learn how to copy the materials through which nature harnesses solar power.” Although man made light-sensitive molecules can be used, Velev says naturally produced products, like chlorophyll, are also very easily integrated in these products because of their particular water-gel matrix. Velev even imagines a future where homes could be covered with soft sheets of similar electrical power-generating man-made-leaf pv cells. The concept of biochemically inspired ‘soft’ products for generating electricity may in the future offer an alternative for the present-day solid-state technologies. About the Author: Colleen J. Mcguire creates for the http://www.solarwaterfountains.org/, her personal hobby blog site focused on recommendations to help property owners to spend a smaller amount energy with solar power. Here is a report on a solar thermal air conditioning system being built in Hawaii. Solar thermal heating and cooling has great potential but has not been capitalized in the way solar PV has, for example. This article discusses how finance, globally, favours ‘clean’ over ‘dirty’ projects. This financial tidal wave is approaching Australia’s shore. Now, large lenders in the US ask if financing a ‘dirty’ project may damage their reputation. Bank of America and JPMorgan both stopped lending to coal giant Massey Energy and Wells Fargo announced that finance for mountaintop removal was limited and declining. This is a stong ‘shadow’ carbon price, making the financing of new coal projects – fossil fuel projects – expensive. The result should be that clean and sustainable projects attract more finance. 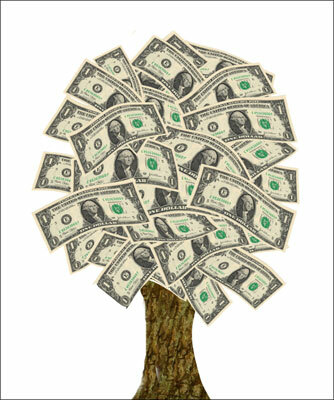 Renewable energy - perhaps money does grow on trees? It shows how increased stakeholder pressure is forcing change to clean and sustainable practices and technologies. See my earlier post on how the supermarkets and other retailers are also reacting to stakeholder pressure and forcing the greenification of their supply chains. There are hints that Australian banks are very sensitive to the publics’ enviromental concearns. The ‘big four’ banks refused to fund the Gunn’s pulp mill in the Tamar Valley, Tasmania. Australian banks are primed to do the same in the energy space. 72 % of Australians think future energy needs should be met through renewable energy – wind, solar – and also energy efficiency. This divergence of consumer expectation from reality exposes the banks to reputation – and consequently financial – risk. I expect a change to Australian bank behaviour – and it can not come too soon. This should have a real impact on the value of intellectual property for clean and sustainable technologies – patents and trade marks in particular. Patent and trade marks are personal property and can be bought and sold just like any other property. Thus, a value can be asigned to them based on what the market is prepared to pay. Increased funding of clean projects makes these IP assests more valuable. A strong portfolio of clean IP assets adds value to a company and can bring in licencing revenue if used smartly. All of this spells trouble for the coal industry. Just a year ago the coal industry was looking very strong. But every week I hear another story of how support of all kinds for coal is vaporising – much faster than what I thought possible. Things are looking up for clean and sustainable IP. According to this report, supermarkets, some of our biggest companies, are driving clean and sustainable technology innovation, forcing change on their supply chains. Plenty of opportunity here for entrepreneurs looking for a new project! According to this report, six countries – Japan, USA, Germany, Korea, France and the UK – are the source of almost 80% of all innovations developed worldwide in the field of clean energy technologies (CETs). This is one of the key findings of a patent-based study on the emergence and distribution of these technologies across the globe jointly conducted by the European Patent Office (EPO), the United Nations Environment Programme (UNEP) and the International Centre for Trade and Sustainable Development (ICTSD). The study shows clearly that the surge of patenting activity in CETs coincided with the adoption of the Kyoto Protocol in 1997, providing a strong indication that political decisions can be important in creating a framework to stimulate the development of technologies which are considered to be crucial to the efforts to address climate change. The statistical analysis of the data shows that patenting rates in the selected CETs have increased roughly 20% per year since then, outpacing the traditional energy sources of fossil fuels and nuclear energy. The report also mentions that China is rapidly gaining ground in the number of cleanip patent filings. I suspect, however, that many of these patents originating from China have a relatively low patent quality, as discussed in this post on solar patent quality. With a headline referring to Volvo cars being made out of batteries, you could be forgiven for thinking that Volvo want to make heavy cars made out of recycled lead from batteries. Instead, Volvo are investigating how to incorporate batteries into the panels. Conceivably, the weight saving would be sensational, as well as dealing with difficult packaging problems. There are likely to be some technical hurdles to overcome. In the meantime, hats off to Volvo engineers for creative and innovative thinking! According to this report, The Australian Information Industry Association (AIIA), has released a whitepaper titled ICT’s Role in the Low Carbon Economy. The report apparently states adoption of Green ICT will generate plenty of money and Jobs for Australia, and also reduce carbon emissions.